It is a common preparation in South-India and preferred to eat with cooked-rice at every level of the society. It is eaten with cooked-rice, Idlli and Dosai. It is become a most likable dish all over India too. It is good to serve it hot. Estimated Time to prepare 0.30 minutes. Boil three cups of Lentil (Arhar-Dhal) in a pressure-cooker for 05 minutes. Take the boiled Lentil and smash and keep them ready. In a frying pan pour 50 gm oil and heat the oil in half flame of the stove and spread the oil inside the pan by lightly lifting and tilting the pan in different directions on the stove. Add 1/4 spoon Fenugreek (Methi) seeds in the oil and fry it till it becomes dark-brown. Bring the flame of the stove into low from the half-flame position. Then add the sliced vegetables turn them with a spoon in the pan, then add 5 cups of water and add the salt stir it well and close the lid covering half of the pan, which will avoid the dish spill over the stove during the process. Increase the flame slightly (less than half to the indication of the stove) Wait for 10 minutes. Now add the boiled and smashed dhall (Lentil) in to the pan and add the rest of the onion and garlic in the mix. 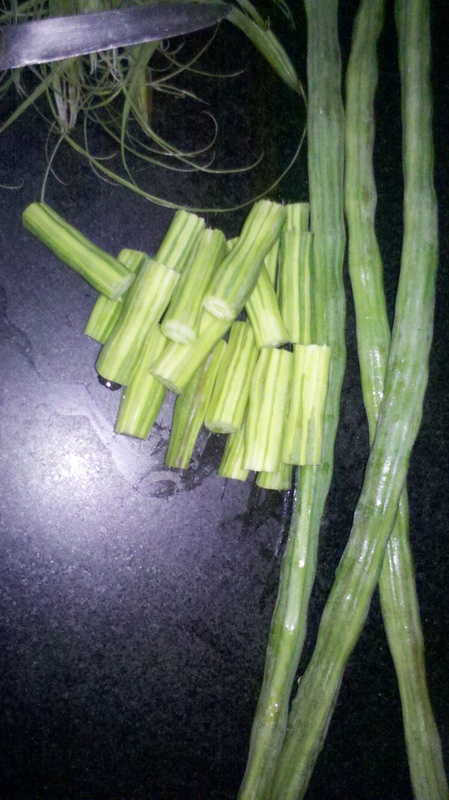 Add water to the needful consistency of the sambar. (the consistency of sambar mix is as such, it could be poured from a spoon). Taste the sambar-dish and check for the sufficiency of salt. Keep the mix in the stove for 5 minutes in half flame then close the stove. Serve it to the taste with Boiled Rice or Iddli or Dosai. All the preparation shall be done in the Slow-flame of the stove. Any one vegetable shall be added to address/name of the sambar-dish preparation, for example, Murungai-kai Sambar (Drum-stickSambarorSajjan-kiSambarorFaliyan-Sambar),orKajar-ki Sambar(Carrot-Sambar), etc. Warning: Add the Veg. quantity to the need (less is always good – to 02 handful according to this recipe), otherwise this preparation would be tuned into Mix-vegetable (Subzi). Little Curry Leaves (Kurry Patha) – 5 to 6 leaf and little thinly chopped Onions shall be fried in one tea-spoonful oil (till the onion become brown/dark-brown) and then pour them into the sambar preparation to add more flavour. Also, Pluck the selected Dhania (Coriander) leaves and spread it on the top of the sambar then stir it to add the taste; do this as an end of the process. When it is eaten with cooked-rice, I prefer and enjoy Egg-omelet as a side dish. Also, Lime-pickle is suitable. All the best and enjoy sambar-dish. Kindly make your comments. Warning: The recipe to prepare Sambar dish is the own experience of the author of this blog. The author of this blog is not responsible for any liability or claims for any adverse results. As far as I know, we, the Tamilians, use Toor Dal (Tuvaram Paruppu) for Sambhar! Yours seem to b an interesting variation with Urad Dal (Ulutham Paruppu). I have an interesting recipe with White Radish! It is Mooli Raita! One Green Chilly, finely chopped. One cup of fresh curd, whipped. Half a teaspoon of Ghee. Method. Peel and grate the radish. Heat ghee and add mustard seeds, turmeric powder, green chillies and coriander leaves. Stir. Add the grated radhish, stirring well until the radish is half cooked. Add salt, crushed walnuts and curd. Change into a serving bowl. Garnish with fresh coriander leaves. A delightfully healthy Raita is ready as an accompaniment to Roti or Rice! I made the correction immediately, it is Tur Dhall – Arhar Dhall in Hindi, Tuvaram Paruppu in Tamil). Thanks for your indication. God bless you. Thanks again, please do indicate more corrections and I will update immediately.